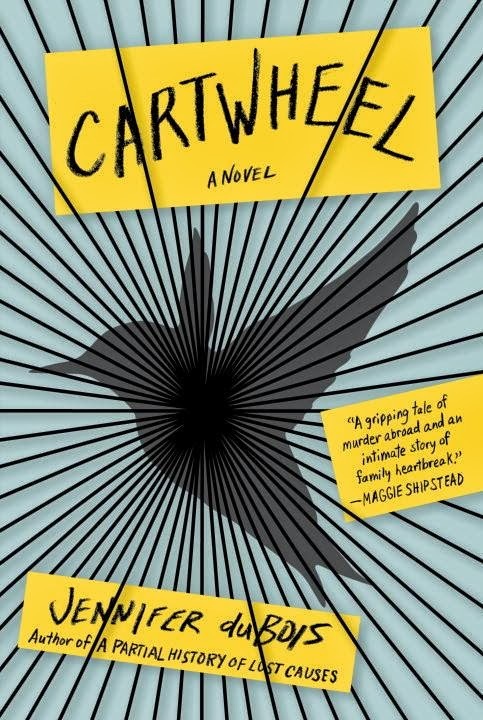 Jennifer duBois' second novel, Cartwheel, is based loosely on--or perhaps "inspired by" would be a more accurate way to describe it--the events of the Amanda Knox murder trials of recent history. The story centers on Lily Hayes, an American college student studying abroad in Buenos Aires. While there, her roommate is found stabbed to death in their shared apartment; Lily is arrested for the crimes, and in short order, her entire life is on display for the prosecutors, judges, media, and entire world to see. What is revealed, in bits and pieces, is Lily, as a person, as a friend, as a daughter, as a lover, as a suspect. She is a 20-year-old girl struggling to become a 21-year-old woman; she tries not to care about her looks, but probably does; she fancies herself liberated enough not to believe in monogamy, but yearns for love nonetheless; she decides to be independent and grown-up and operate without parental advice as much as possible, but needs their love and support more than she can say. "She was typical," her father reflects, not unkindly, "She was aggressively typical--all the more so if she didn't quite know it yet." Over the course of the fast-paced, captivating novel, duBois reveals small details about Lily and her actions, both leading up to and after her arrest. Some of the details are small, insignificant, mundane: Lily dropped a glass at work, breaking it; Lily once killed a slug as a child; Lily liked Winnie-the-Pooh growing up. Others are more crucial: Lily kissed her boyfriend passionately, in public, mere hours after her roommates death; Lily had been smoking marijuana; Lily had blood on her face; Lily's DNA is at the crime scene. And one is the most important of them all: Lily did a cartwheel after being interrogated. It is these details that give us the rest of the characters in Cartwheel: How do her parents view her actions? Her sister? What does the prosecution make of them? What of her boyfriend? How does the media make this look? As duBois skillfully peels back the layers of Lily's life, from the photographs she took on her arrival in Argentina to stories of her childhood to her strange actions after her arrest, Lily's world comes to life before us. She is the daughter of parents who lost their oldest child; she is the older sister to a girl who feels overlooked; she is the not-so-liberated girl who might be falling in love with an oddball; she is the roommate of a student who appears to be perfect; she is the fall-guy for her host parents when things go wrong. What Lily's life reveals in its ordinary details, in her daily emails with her family, her fights and makeups with her roommate, her strange conversations with her neighbor, is precisely that it is ordinary. And yet this extraordinary thing has happened to her--murder, and arrest, and it casts everything in a new light. duBois is no stranger to using the mundane to reveal a bigger, grander story about what it is to live; her skill with language, her impeccable sentences, and her tendency to probe the philosophical questions of life were what made me fall in love with her debut, A Partial History of Lost Causes. In Cartwheel, she has turned these skills to answering the typical whodunit question, "Did she do it?" But what comes to light as she progresses is that that is not the important question at all; what really matters is how we answer the question, "Could she do it?" This is the driving force behind the narrative in Cartwheel, and what keeps a well-covered subject from every feeling stale in duBois' very skilled hands. 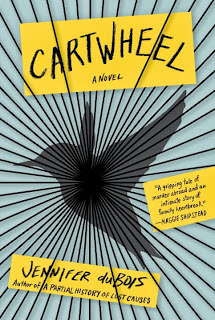 This review is part of the TLC Book Tour for Cartwheel. Be sure to check out what others thought of the novel, and if you're interested in reading it yourself, good news! Thanks to TLC Book Tours, I have one copy available to giveaway. US only, please. Contest closes 10/11. Ooooh! Don't want to push my giveaway luck, but this one is definitely high on my to-read list! This book definitely sounds really interesting and I like how it adds a touch of humanity by showing who Lily is, past her predicament as a possible/probable killer, to such a horrific story. Throughout reading your review of the book, I couldn't help but rethink my own opinions on the Amanda Knox case since the book seems to be heavily influenced by the events. I didn't follow the Knox case too closely, but this was definitely influenced by that story. sounds intriguing. thanks for the giveaway! I heard about this from another blogger taking part in this tour and it sounds super interesting. That said, can I enter on your blog if I entered on a different one? Maybe I'll enter but if that's not allowed feel free to delete my entry! Just bought this one the other day and can't wait to read it. Such a gorgeous book as well! Yes, I love the cover of this one. Hope you enjoy it. Thanks for hosting a giveaway, I'm looking forward to reading this one. We even reviewed on the same day? Great minds and all that. I especially like how we both thought it was a great book but came at it from different angles. One more reason I think this is a super book club book- everyone will find something different to talk about. I am dying to read this book. I've heard nothing but great things about it. Wow, it sounds like this is an intriguing and compelling read, and well-written as well!